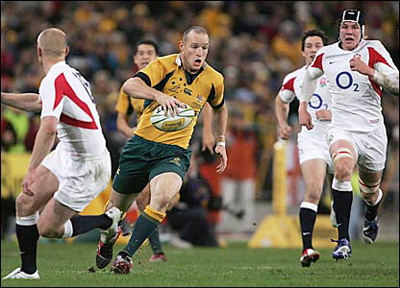 The Mole was bleating about the omission of Stirling Mortlock [34, Australia & Melbourne Rebels] from the Australian World Cup squad in a recent post, and guess what? That’s right, still bleating. Mortlock might be ‘too old’ by most standards for international backs, but Dingo Deans has picked a backline with no leaders whatsoever in the threequarters. None. Adam Ashley Cooper? Nice guy – who’s he ever captained? Faainga? Grey Man McCabe, a guy purposely bereft of personality? It’s a youth-movement gone mad, I tells yeh. It’s like putting a hula-hoop or a frisbee on your crest. I blame Playstations etc. Given the fact that the Aussies have Russia and the US in their group, two games where you can afford to give your squad a run-out, the Mole would certainly have brought the Evil Wizard Mortlock as part of the squad – captain on the day for those games, but really just so you could have his leadership and experience within the squad. He kicks goals too – what’s not to like? Rob Fruean [23, Canterbury Crusaders] has loads of competition from Kahui, Superstar Sunny-Bull Wull’yums, Snake Smith and Ma’a Nonu [who’s looking surprisingly like the best centre in the world these days], just like Luke McAlister. Still, some people thought he was in with a shot for the NZ RWC11 squad. The Mole didn’t. Doesn’t mean he’s not a good player though. 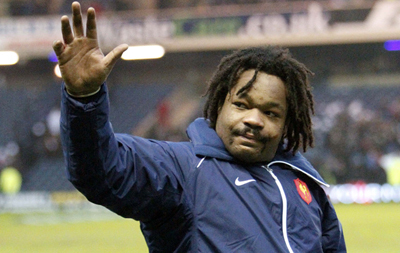 Mathieu Bastareaud: First into the building in the morning, last one to leave. Unfortunately the building is the canteen, not the gym. Matthieu Bastareaud [22, France and Toulon] is mental, fat and has huge talent. 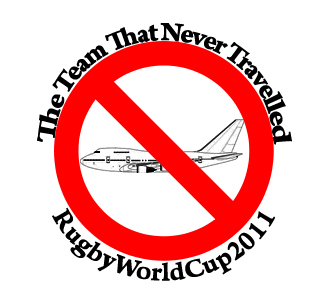 In this instance, anybody can see a good few reasons why Marc Lievremont didn’t bring him to RWC11. The fact that he got drunk, fell down, lied and caused a diplomatic incident the last time he toured New Zealand is a pretty big one. Hmmm. We all know what I’m talking about. Mental health is clearly not something to joke about, but it was a situation that he got himself in and then just kept on digging. Aside from that incident, there’s a whole heap of evidence to suggest that Jabba is pretty clearly a guy who isn’t quite mature enough to thrive in a tournament setting. He’s clearly overweight, gives out conflicting interviews to the media – the most recent ones have been over his recent transfer from Stade to Toulon – as though nobody will publish them and call him up on it, and seems not to gel with some of his teammates. On the other hand, he’s still a kid, and recent performances with the Barbarians have shown just how talented he is – a bone-jarring tackler, terrifying runner with ball in hand and, in the manner of far more svelte French backs, an extremely good distributor and offloader. His performance in the 2010 Six Nations game, where he gave Brian O’Driscoll way more than he could handle, showed just how good he was. He still can live up to that potential, but it won’t be in this tournament. 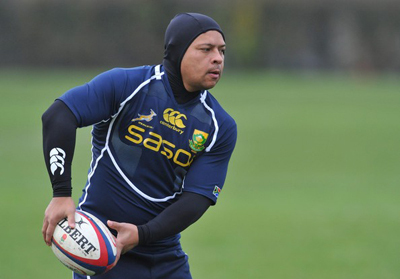 Adi Jacobs [31, SA & Natal Sharks]: debuted in 2001, dropped in 2002, recalled in 2008. That’s a hell of a way to start your career. The last match he played in before his recall was the 53-3 hiding that England put on the Boks in November 2002 at Twickenham; that goes part way to explaining the big gap in the middle of his international career. Jacobs came in for a lot of stick on the 2009 Lions tour, when he started two matches ahead of Jaque Fourie in the centre. It was widely seen to be a political call from Crazy Piet, and Jacobs’ reputation suffered more than it should have. While the Fourie/de Villiers has gone on to re-establish itself since then, Jacobs has rescued his reputation by consistently turning in crafty, footballing performances for Natal Sharks and, when required, the Boks. He’s a clever attacker whose running lines make space for his outside backs and has a great distribution game. Good player. Florian Fritz - why no love? Florian Fritz [27, France & Toulouse] has been capped by both Marc Lievremont and Bernie Laporte: he’s got nineteen caps with seventeen of them being starts, so he’s obviously a player to be reckoned with. With that said, he has only once played a full Six Nations campaign, back in 2006, when he started every match in a championship the French won without a Grand Slam. Aside from that, he has always been in and out of the French lineup. The first of his caps came back in June 2005, the last of them five years later in June 2010. This entry was posted in The Team That Never Travelled and tagged Adi Jacobs, Florian Fritz, Mathieu Bastareaud, Rob Fruean, Stirling Mortlock, The Team That Never Travelled by dementedmole. Bookmark the permalink. Florian Fritz also has potentially the greatest name in test rugby.